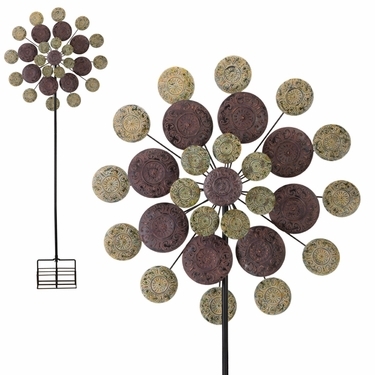 Bring excitement to your gardens with our new large Sage Medallion Wind Spinner! Triple-bladed designs spin in opposite directions creating a wonderful effect. Handcrafted designs are painted in vibrant metallic colors that dazzle as they spin! Available in five styles: Sage Medallion, Starflower, Maha Rasa, Infinity and Galaxy. Size: 32" x 9.5" x 85"H, 9.5 lbs. Watch our New Triple Spinner in Action!